Jenn-Air Crosley Admiral Norge Range Cooktop Stove 8 Heavy Duty Burner 12001560. This heavy duty 8 burner element has 5 turns/rings and has a heavy duty D-Frame structure to support the element. This burner element is rated at 2600 watts. The wire looped terminals have been replaced with these solid terminals. This element also replaces some flat style terminal elements. Whirlpool Estate KitchenAid Roper Maytag Admiral Amana Speed Queen Jenn-Air Magic Chef Crosley Caloric Glenwood Hardwick Menumaster Modern Maid Montgomery Wards Norge JC Penney Wards Sears Kenmore. The surface burner elements, those metal components that get red-hot and generate heat, are the most important parts of any range. When the elements fail to heat properly, it's time to replace them. It's a simple procedure any electric stove owner can easily accomplish in a few minutes' time. If the burner works, you know its original receptacle is probably faulty. If it doesn't work in the good receptacle, the burner is bad and must be replaced. Do not be alarmed if a new element smokes a little when you first use it. 12001560 12001230 04000075 04000055 Y04000075 Y04000055 7406P088-60 7406P080-60 74004089 74004087 74001775 74001774 12500115. 3523XRA 3523XRW 3542XRA 3542XRW 3563XYA 3563XYW 3621WRA 3621WRW 3621XRA 3621XRW 3842SRA 3842SRW 3842VRV 3842WRV 3842XRA 3842XRW 3860XVA 3860XVW 3862VVD 3862VVV 3862XRA 3862XRW 3862XVA 3862XVW 3882VRV 3882XRA 3882XVA 3962VVA 3962XVB 5651XUA 5651XUS 5651XUW 5892VRA 5892VRV 5892VVA 5892VVV 5892XRS 5892XVS 6551WUA 6551WUW 6551XUA 6551XUB 6551XUW 6651XUS 68-454650 68-454657 6892VRA 6892VRV 6892VVA 6892VVV 6892XRA 6892XRS 6892XRW 6892XVA 6892XVB 6892XVS 6892XVW 6893VVD 6893VVV 6893XVB A3531WRA A3531WRW A3531XRA A3531XRW A3631WRA A3631WRW A3832SRA A3832SRW A3832XRA A3832XRW AER1360AGW AER1360BGW C3510PVV C3521WRV C3523WVA C3523WVV C3542XRA C3542XRW C3581VRV C3581VUV C3581XRA C3581XRW C3842XRA C3842XRW C3862VYV C3862XYB C3882VRV C3882VVV C3882XRA C3882XRW C3882XVA C6892XVS CC3510PVV CC35111ACV CC35111BCV CC3520SRA CC3520SRW CC3531WRA CC3531WRV CC3531WRW CC3531WUV CC3531XRA CC3531XRL CC3531XRW CC3531XUW CC38300ACV CC3872XVA CC3872XVW CE35111AAQ CE3531WRA CE3531WRV CE3531WRW CE3531WUA CE3531WUV CE3531XRA CE3531XRW CE3531XUA CE3531XUW CE3552XRA CE3552XRW CE38300BAB CE38300BAQ CE38300BAT CE38300BAV CE38300BAW CE3832SRA CE3832SRW CE3832XRA CE3832XRW CEP3540AAA CEP3540AAQ CEP3540AAW CER1360AAH CER1360AAL CER1360AAW CER1360ACH CER1360ACL CER1360ACW CER1360BAW CER1360BCW CER3540AAA CER3540AAH CER3540AAL CER3540AAQ CER3540AAT CER3540AAW CER3540ACA CER3540ACB CER3540ACW CER3540BAH CER3540BAQ CER3540BAT CER3540BAW CES3540AAC CES3540AAW CES3540ACB CES3540ACC CES3540ACW CHE9000ACB CHE9000BCB CHE9000BCE CRE7500ACL CRE7500ACW CRE7500BDL CRE7500BDW CRE7600ACL CRE7600ACW CRE7600BDL CRE7600BDW CRE7600CDE CRE7700ADE CRE7700ADL CRE7700ADW CRE7700BDE CRE7700BDL CRE7700BDW CRE7700CDE CRE8400ACL CRE8400ACW CRE8400BCL CRE8400BCW CRE8400BGW CRE8600ACL CRE8600ACW CRE8600BCL CRE8600BCW CRE8600CCB CRE8600CCE CRE8600CCL CRE8600CCM CRE8600CCW CRE8700ADE CRE8700ADL CRE8700ADW CRE8700BDE CRE8700BDL CRE8700BDW CRE8700CDE CRE8700CDL CRE8700CDW CRE8700DDE CRE9300BCW CRE9300CCL CRE9300CCW CRE9400ACE CRE9400ACL CRE9400ACW CRE9400BCE CRE9400BCL CRE9400BCM CRE9400BCW CRE9400CCE CRE9400CCL CRE9400CCM CRE9400CCW CRE9500ACE CRE9500ACL CRE9500ADE CRE9500ADL CRE9500ADW CRE9500BCE CRE9500BCL CRE9500BCW CRE9500BDE CRE9500BDL CRE9500BDW CRE9500CCE CRE9500CDE CRE9500CDL CRE9500CDW CRE9500DDE CRE9500DDM CRE9530BCE CRE9530CDE CRE9530CDM CREA450ACL CREA450ACW CREA600ACE CREA600ACL CREA600ACW DCF4115AC DCF4115AW DF454670 DF454676 DF454677 FCE10500A FCE10500B FCE10500W FCE10500WC FCE10501WC FCE10510A FCE10510B FCE10510W FCE10610A FCE10610B FCE10610W FCE10610WC FCE2010B FCE2010W FCE2011B FCE2011W FCE2012B FCE2012W G3862XRA G3862XRW GA3872XUW GM3862XUW H3531WUA H3531WUW H3531XUA H3531XUW JE3842VRV JE3842XRA JE3842XRW JER8500AAA JER8500AAW JER8530AAQ JER8530AAW JER8550AAA JER8550AAB JER8550AAW JER8550ACB JER8550ACW JER8650AAA JER8650AAB JER8650AAW L3510PRV L3521WRV L3521XRA L3521XRW L3523WVV L3581VUV L3581XUA L3581XUW L3832VRV L3832XRA L3832XRW L3872VRV L3872VVV L3872VYV L3872XVB L3872XYB L3882VRV L3882XRA L3882XRW L3882XVA L3882XVW L6892VRV L6892VVV L6892VYV ME3842VRV ME3842XRA MEC4430AAB MEC4430AAC MEC4430AAQ MEC4430AAW MER4320AGH MER4326AGW MER4530AAA MER4530AAH MER4530AAL MER4530AAQ MER4530AAW MER4530ACH MER4530ACL MER4530ACW MER4530BCW MER5510AAH MER5510AAL MER5510AAT MER5510AAW MER5510BAB MER5510BAQ MER5510BAW MER5511BAQ MER5511BAW MER5530AAH MER5530AAL MER5530AAT MER5530AAW MER5530ACW MER5530BAB MER5530BAQ MER5530BAW MER5530BGW MER5550AAA MER5550AAH MER5550AAL MER5550AAQ MER5550AAT MER5550AAW MER5550BAB MER5550BAQ MER5550BAW MER5570AAA MER5570AAQ MER5570AAW MER5570ACA MER5570ACQ MER5570ACW MER5570BCQ MER5570BCW MER6549BAQ MER6549BAW MER6550AAQ MER6550AAW MER6550ACQ MER6550ACW MER6550BAQ MER6550BAW MER6550BCQ MER6550BCW MES5570AAB MES5570AAW NER1360ACW NER3540ACW PER4310BAQ PER4310BAW PER4310BCW PER5502BAH PER5502BAT PER5505BAH PER5505BAT PER5510BAQ PER5510BAW PER5515BCQ PER5515BCW. Our mission is to become the #1 source for all your appliance part needs. We will attempt to process your address change, cancellation and order change as quickly as possible. However, we cannot guarantee that we will be able to provide this service. Please review your order for accuracy before submitting it. The time frame depends on your location and is determined by the Post Office. You may go to their website and click "Calculate a Price" to determine if your package will take one or two days to deliver. In no way shall General Appliance Parts be liable for any loss, damage, fire, explosion, injury, including any incidental or consequential damages, or death as a result of ordering and/or installing any parts from our website or from the results of any action taken due to reading information found on our website. The information is provided as a courtesy to our customers to enhance their understanding of their appliances, it is not to be taken for instructional purposes on how to repair their system. General Appliance Parts suggests having all parts, accessories and equipment installed by a qualified heating and air conditioning technician. If a customer attempts to install a part, accessory or equipment, he or she should have a thorough understanding of electricity, reading wiring diagrams and the work to be performed. In no way shall General Appliance Parts be liable for any loss, damage, injury, including any incidental or consequential damages, or death as a result of ordering and/or installing any parts from our website or from the results of any action due to reading information found on our website. 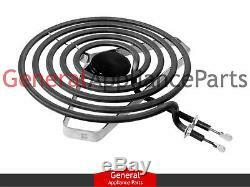 The item "Jenn-Air Crosley Admiral Norge Range Cooktop Stove 8 Heavy Duty Burner 12001560" is in sale since Wednesday, May 23, 2012. This item is in the category "Home & Garden\Major Appliances\Ranges & Cooking Appliances\Parts & Accessories". The seller is "generalapplianceparts" and is located in Louisville, Kentucky. This item can be shipped worldwide.